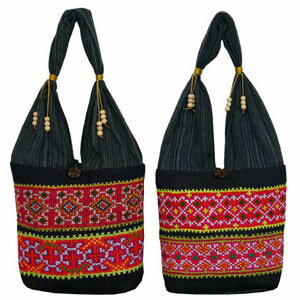 The Lanna artisans handcraft this lovely set of small shoulder bags with cotton. The bodies are decorated with colorful fabrics hand-stitched by Thailand's ethnic minority people. Golden cords and rain tree wood beads adorn the straps. They are lined with cotton and fasten with a hoop over a button carved from rain tree wood. This set of handmade shoulder bags may vary slightly in colors, motifs, weight and size. Color discrepancies may occur between this item and your computer screen. Materials: 100% cotton, polyester cords, coconut shell and rain tree wood. Lining 100% cotton. 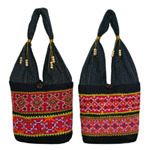 This set of shoulder bags is handmade by artisans in a small workshop located in northern Thailand.